For one night only - An Evening with Dame Diana Rigg! An Evening with Dame Diana Rigg tickets are now available. See the legend of stage and screen herself at the Queen Elizabeth Hall at the Southbank Centre this March. With a career spanning several decades playing iconic roles, such as Emma Peel in The Avengers to her most recent screen appearance as the acid-tongued Olenna Tyrell in Game of Thrones, Dame Diana Rigg is sure to have a whole host of anecdotes for the audience that evening. This is a rare intimate evening with famed writer and broadcaster Edward Seckerson who has vowed to ask all the questions leaving no stone unturned - or as Dame Diana once said, No Turn Unstoned. Following a successful run last year on Broadway Dame Diana received a Tony Award nomination for her role in My Fair Lady. From her early days at the Royal Shakespeare Company performing with Laurence Olivier to her most recent roles, this is sure to be a night filled with glorious stories and a rare insight into the personal life of one of the greatest actresses of our time. 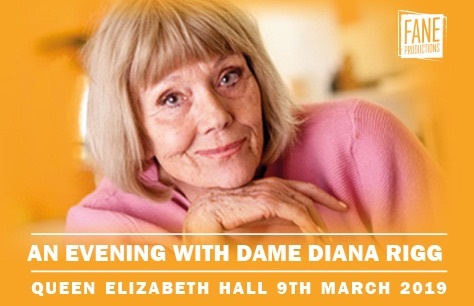 Book your An Evening With Dame Diana Rigg tickets today. A delightful time with a delightfull performer, talking with true passion and wit about her career as an actress, her life as a woman, her love for theater, her opinion on writing, filming, performing... Dame Diana Rigg's fantastic memory served for this 90 min flied by in a instant, packed with delicious anecdotes, humour, deep thoughts... No melancholy here, but a sharp look on what times used to be and what they are now. An optimistic, educated and brilliant mind. Lovely event. I was a bit disappointed that her TV and movie career was almost completely ignored. I guess many people in the audience would have expected a bit more talk about her experience with cult TV show The Avengers and on set of James Bond - On Her Majesty's Secret Service, but the host (who did a good job in general) unfortunately neglected that and focussed solely on her theatre career.